Almost everyone on the planet knows Disney. It's a brand that is synonymous with something magical and inspirational. At the heart of Disney is the iconic Mickey Mouse. For the upcoming holidays, why don’t you bring Mickey Mouse into your home? After all, who doesn't want some cheerful inspiration? While you're at it, place Mickey Mouse where he is very visible, and that's on top of your Christmas Tree. Of course, you will have to get one first. To help you with that, this article is going to feature six of the best Mickey Mouse tree toppers at the moment. 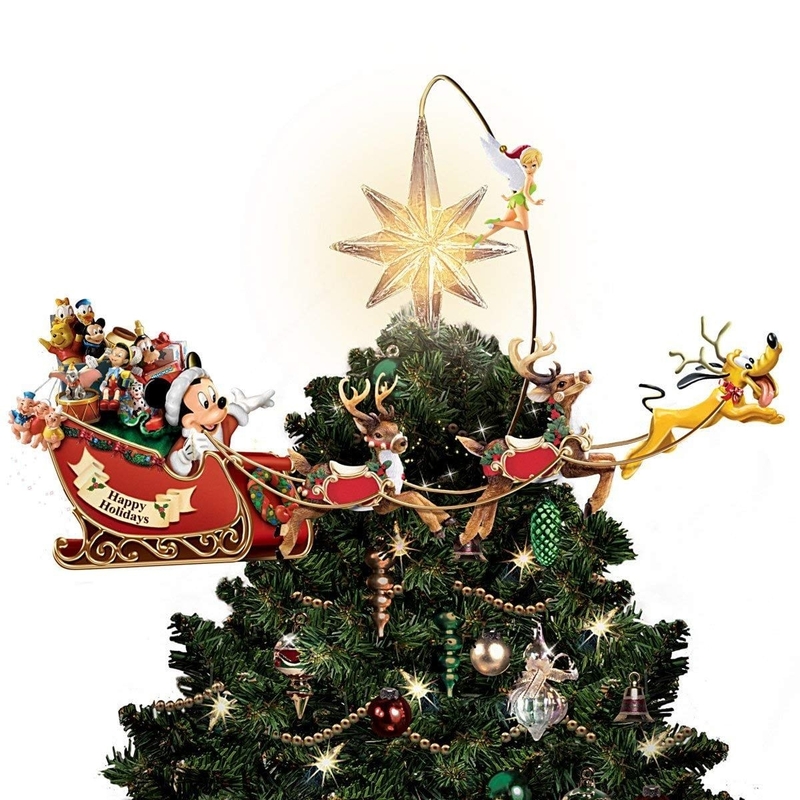 This Mickey Mouse tree topper is perhaps one of the most eye-catching. It features plenty of interesting elements that onlookers can't help but be mesmerized. The tree topper has two significant aspects. First, there's a big eight-pointed star that is attached to the top of the Christmas tree. Then, there's Mickey Mouse cheerfully riding Santa's Sleigh. Of course, the sleigh is pulled by reindeers, and there's Pluto leading the pack. Connecting the two elements is a gold-colored wire with Tinkerbell in the middle. Every part of the product is finely crafted by master artisans. However, that's not all there is to it. When you switch the topper "on," things get really exciting. The big star lights up with a bright and warm glow. Then, Mickey Mouse's sleigh begins to rotate around the circle slowly. It's really a sight to watch. Nothing’s more adorable than Mickey Mouse wearing a Santa suit and holding treats for the all the little good boys and girls. Also, this product is an officially licensed one. Thus, you can be sure you're not buying a copycat from a hole-in-a-wall workshop. Because it's an official item from Disney, everything is made from high-quality materials and crafted with attention to details. Another exciting feature of the product is the bendable arms. This means you can position Mickey Mouse's arms in any pose you want. You can infuse your own creativity on this one. The product is also versatile. While it's marketed as a tree topper, you can just remove the attaching mechanism, and it will work as a free-standing decor. The item stands are around ten inches tall, and it's just the right height for a small to medium-sized Christmas tree. Most tree toppers come with a single product. If such kind of offers is a bit dull for you, why not get one with multiple items. With a packaged that includes five items, this one is among the best deals out there. The packaged includes one tree topper and four hanging ornaments. The tree topper is in red with a bit of glitter in green and white. The hanging decorations come in clear, red, and green. Each ornament comes with its own unique pattern and style. Of course, each item incorporates the recognizable Mickey Mouse logo in one way or another. Even just looking at the products, it already brings out that feeling of festive cheerfulness. Another important thing that's worth mentioning is the primary material. While other tree toppers come in fabric and foam, this product is made from glass. It's safe to assume that glass is the more luxurious material. If you think that it's not right for Mickey Mouse to be hanging out alone at the top of your Christmas tree, then you'd probably love this item. With this piece, you'll have both Mickey Mouse and Minnie Mouse sitting side by side. The two are in a happy mood, inspiring everyone to be the same. The item is also designed to emphasize the iconic duo as they sit inside a relatively big green ring. Furthermore, the ring is decorated with spheres of varying colors. The entire setup catches the attention of your guest and directs the focus to the stars of the show. At the bottom of the ring is a big red pole that's designed to fit on top of your Christmas tree. With Mickey Mouse and Minnie Mouse, the product design and the festive bright colors, it's a tree topper that's hard to miss. This tree topper is perfect for shoppers that find the non-moving decors as too boring. The Mickey Mouse on this item has a lot of things going for it, and this section will cover some of the most important ones. The item features Mickey Mouse in a Santa suit. He's also carrying a bag of gifts for everyone. He is holding on to a pole on the one hand, while carrying a lantern on the other. The pole is in a gold finish, and it attaches on top of the Christmas tree. Now for the exciting part. This Mickey Mouse animates when you turn it on. He swings the lantern up and down while turning his head from side to side. With a big grin on his face, it's hard not to smile watching the whole sequence. The product is 12 inches tall. Hence, it’s a striking addition to your Christmas tree. The appearance of Mickey Mouse and Minnie Mouse has slightly evolved throughout the years. While the newer versions come with a modern feel, there are people out there that find the older versions more appealing. If you are one of them, then this Mickey Mouse tree topper might be the one for you. The item showcases Mickey Mouse sitting on top of a classic-looking red globe ornament. He'd feel lonely if he's all alone, so Minnie Mouse joins in. The green cone holds the red globe on one end, while the other end attaches to the Christmas tree. To spice up things further, this item has one more surprise. When you turn the setup "on," the red globe ornament will start to light up. It's an item that's flashy while being heart-warming and nostalgic at the same time.